Salty Dog was born in Daytona Beach, Florida, in 1979 in an old surf wax shipping crate in the back of the Salty Dog Surf Shop. 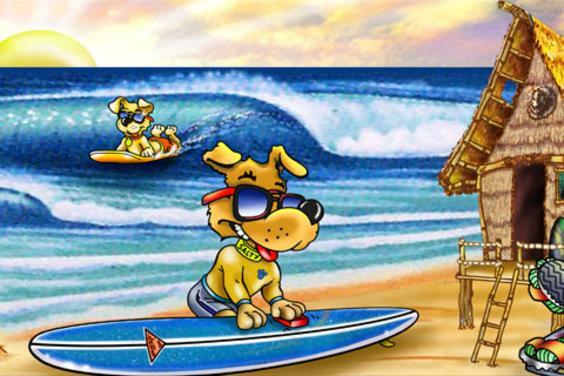 It was obvious to everyone from the time he climbed out of his box with sand and wax on his feet that he would be a surf dog. His first birthday present was a surfboard, and since then he has been seen windsurfing, snowskiiing, skateboarding, and many other activities. He has become the coolest dude to hit the beach in a long, long time. He's never without his shades no matter what he's up to, it's a wonder they stay on his head. I guess when you're cool, you're "totally cool". And this is only the beginning of the story!